The struggle against neoliberalism has been at the center of the Peoples’ Summit since its beginnings. 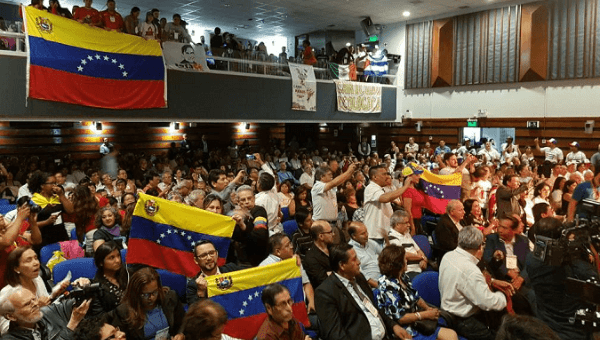 April 11 (teleSUR) Strong support for former Brazilian president Luiz Inacio ‘Lula’ Da Silva, the Bolivarian Revolution, Venezuela, and Cuba marked the first day of the Peoples’ Summit in Lima, Peru. The Summit is an alternative to the VIII Summit of the Americas scheduled to take place between April 13–14. While heads of state and other officials discuss democratic governance and corruption, corruption and sustainable development, international cooperation and public-private partnerships, social movements, progressive political parties, workers’ unions, students, women, and other popular sectors discuss what the People’s Summit has defined as a neoliberal, neoconservative counteroffensive against the region’s progressive leadership. The struggle against neoliberal policies, including austerity, privatization, and open markets has been at the center of the Peoples’ Summit since its beginnings. Geronimo Lopez, Secretary General of Peru’s General Confederation of Workers, issued a call to mobilize and march on April 12 and 14 against United States policies, in defense of social rights which are threatened by the implementation of austerity policies in the continent, and to reject what they call right-wing destabilizing plans. Regional support for Venezuela has gained momentum after Peru’s rescinded Nicolas Maduro’s invitation to participate in the Summit of the Americas, the latest attempt to isolate the country. Maduro is not the only president who will not be present. Gaston Browne, Prime Minister of Antigua and Barbuda, confirmed he was not going to Lima in solidarity with Venezuela. United States President Donald Trump also canceled saying he will stay in Washington to oversee the country’s response to Syria. The People’s Summit celebrated Trump’s decision. The Secretary-General of Peru’s Communist Party Red Homeland, Flor Maria Gonzalez, announced the region’s Communist parties signed shared principles in which they ratified their will to build a more just and humane Patria Grande, or Great Homeland, reaffirming their internationalist stance, and solidarity with the people of Venezuela and president Nicolas Maduro. They will discuss several issues that are not part of the agenda for the VIII Summit of the Americas, including gender equality and LGBT rights, the neoliberal onset, the rights of campesinos and land tenure, U.S. anti-immigrant policies, and the peoples’ struggles in other regions. David Choquehuanca, former Bolivian Foreign Minister and current Executive Secretary of the Bolivarian Alliance for the Peoples of Our America – Peoples’ Trade Treaty (ALBA-TCP) will give a keynote address on April 13.